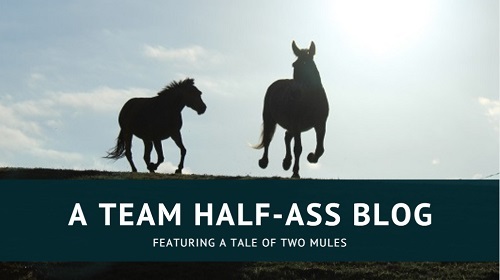 Mule Tales is a new feature for the blog. I might occasionally talk like Marty is the only mule in the world, that the universe revolves around him etc. etc., but the truth is there are a lot more out there and, to be honest, they are almost certainly better mule ambassadors than my long-eared miscreant. I have met a lot of fantastic people thanks to Marty and I really wanted the chance to share their stories and their mighty, magnificent, mercurial mules with you all. 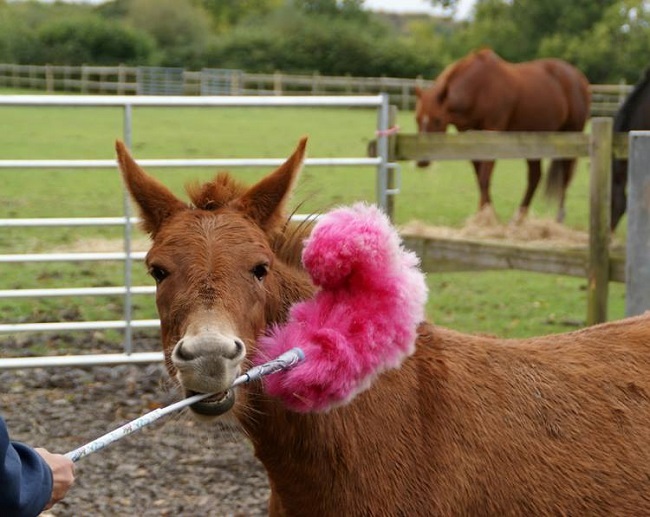 Our first Mule Tale is Henrietta, owned by Sarah in the south of England. You can find out more about her on Sarah’s website or her Facebook page, Sarah Weston Logical Horsemanship. 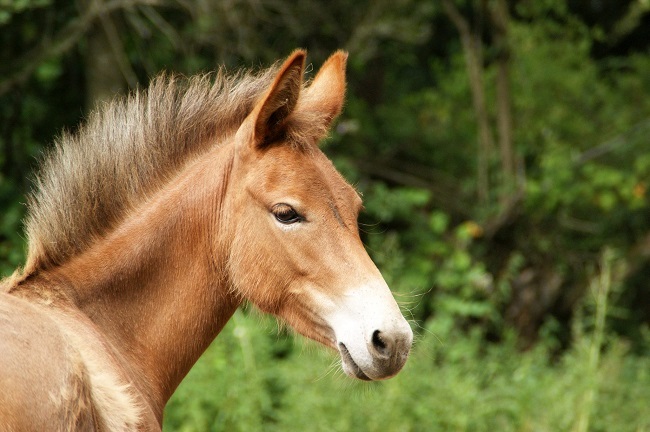 My mule is called Henrietta, Henrietta the Eighth because she is my eighth equine. My husband told me that if I got another horse he would divorce me so I bought Henry instead. I first met Henry when she lived out on the New Forest, first with her mother who was sadly killed by a car, and then with other ponies. Unfortunately her best friend was also killed by a car, but she always seemed to pal up with another set of ponies and carry on in her own little way. Last summer I noticed that her feet were getting terribly long and so I contacted the Verderers to alert them to the problem. She was eventually rounded up after three tries and because it was all a lot of work for her owner to get her tamed they decided they didn’t want her any more. Worried that she might be put down, I offered to buy her for £50 and she was duly delivered to my fields. At the moment I am still working on gaining Henry’s confidence. Being born wild, being rounded up, and perhaps just her very nature, means that she doesn’t trust people at all. I have worked my way through touching her with a feather duster and then my hand, first of all on her face and now all along her body and even down to her hocks. She is still very wary but finds human beings intriguing. She often looks like a little professor as she studies everything that you do. Fortunately her feet have been abraded by the concrete of my barn floor where she goes in to eat all of her meals. I have no ambitions or time-frame, I would just like to be able to handle her feet eventually and hopefully not resort to sedation. 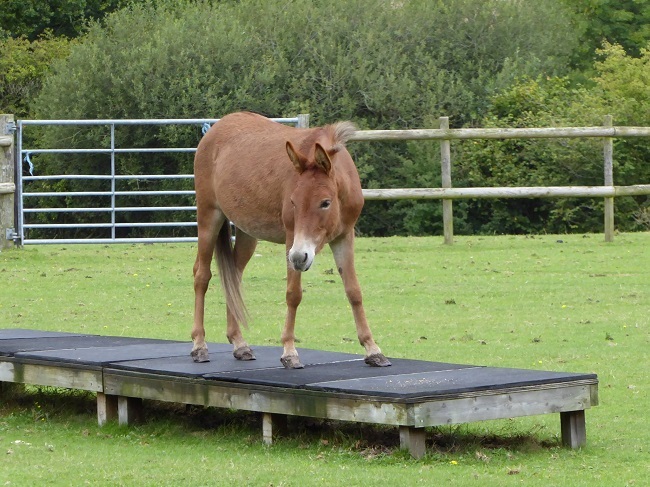 At liberty she will stand on a bridge or go over a small jump but it would be good to be able to put a headcollar on her too, especially if there were an emergency. I love my little mule and find her comical and endearing. I think she quite likes me but if I was being anthropomorphic I think she seems me as a cross between the family butler and shopping on line. She loves ginger biscuits and is always enquiring after their welfare. Just a few weeks ago someone left the gate open to my field and Henrietta wandered out on to the open Forest. I thought oh no, that’s it, she’ll go, but instead she came to call and for some clickered food. I am so glad I have taught her clicker training. 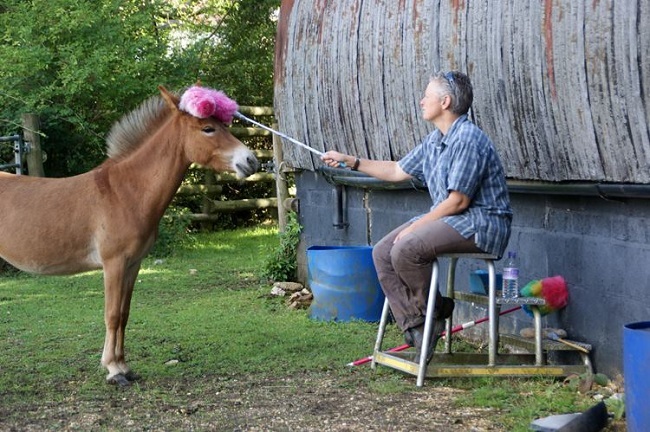 I am an IH trainer which I couple with clicker training, but I think clicker is the only way I would have ever got anywhere at all ever with Henry – and she agrees. The most important thing I have learned is just how different mules are to horses; far more intelligent but intelligent at being a mule. She is fast, and agile, and rarely makes a mistake, she only does anything by consent. She studies things very carefully and almost interrogates you when you are showing her something new. Having just one mule triples the IQ of a herd of seven horses. 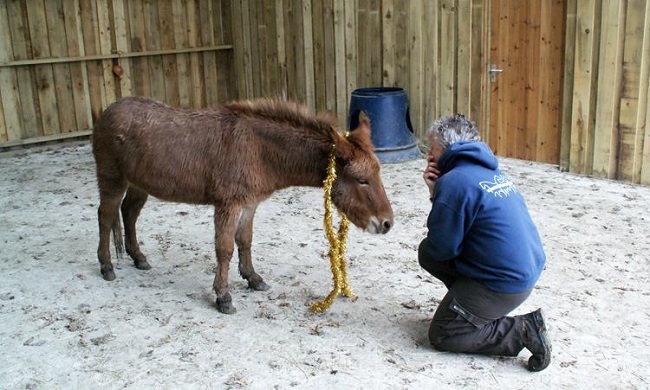 The only advice I can give would be to accept that mules are very sensitive and emotional creatures. Great job Sari. Love seeing my Henrietta in ‘print’ and your writing is so eloquent. It’s all your writing, Sarah!